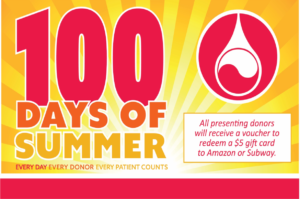 Take part in the 100 Days of Summer blood drive, hosted the Mississippi Valley Regional Blood Center. Please eat and drink before donating, and bring a photo ID. All presenting donors will receive a voucher to redeem a $5 gift card to Amazon or Subway!